WOULD you like to hear the best rock band on the planet playing acoustic for free? Then you are in the right place. 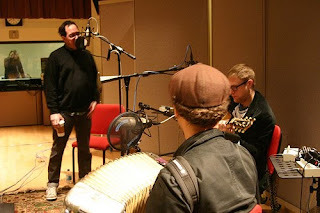 This is another great podcast featuring The Hold Steady, this time from Chicago Public Radio's briliant Sound Opinions programme and what an archive it has. Please look at its offerings here. The highlights of the show below see lyricist Craig Finn discuss his literary influences, what it's like to sing Rosalita on stage with Springsteen, why Joe Strummer's musical knowledge was encyclopaedic as well as Finn, guitarist Tad Kubler and pianist Franz Nicolay playing two songs acoustic. I shudder to say this, but: enjoy. And go here to see the band playing well tight and loud for Yahoo's The New Now portal.